Non-violence and kindness to living beings is kindness to oneself. 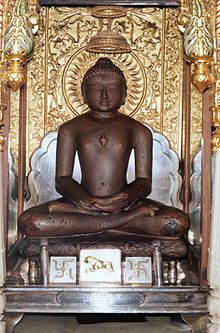 Mahāvira (वर्धमान महावीर) or Mahāvir (the "Great Hero"); also, Vardhamāna (increasing) or Niggantha Nāthaputta (599 BC – 527 BC), was a philosopher and teacher who developed the core traditions of Jainism. Ācharanga Sutra, Book 1, lecture 4, lesson 1, as translated by H. Jacobi, quoted in The Boundless Circle : Caring for Creatures and Creation (1996) by Michael W. Fox, p. 262. As quoted in Religion and culture of the Jains (1975) by Jyotiprasāda Jaina, p. 187. As quoted in Let's Celebrate! (1987) by Caroline Parry, p. 127. As quoted in Jainism and Indian Civilization (2004) by Raj Pruthi, p. 24. Sam Harris, Letter to a Christian Nation (2006), p. 23, ISBN 0-307-26577-3. Māhavīra proclaimed a profound truth for all times to come when he said: "One who neglects or disregards the existence of earth, air, fire, water and vegetation disregards his own existence which is entwined with them." Jain cosmology recognizes the fundamental natural phenomenon of symbiosis or mutual dependence, which forms the basis of the modern day science of ecology. It is relevant to recall that the term "ecology" was coined in the latter half of the nineteenth century from the Greek word oikos, meaning "home", a place to which one returns. Ecology is the branch of biology which deals with the relations of organisms to their surroundings and to other organisms. The ancient Jain scriptural aphorism Parasparopagraho Jīvānām (All life is bound together by mutual support and interdependence) is refreshingly contemporary in its premise and perspective. It defines the scope of modern ecology while extending it further to a more spacious "home". It means that all aspects of nature belong together and are bound in a physical as well as a metaphysical relationship. Life is viewed as a gift of togetherness, accommodation and assistance in a universe teeming with interdependent constituents. Laxmi Mall Singhvi, in "Jain Declaration of Nature" in Jainism and Ecology : Nonviolence in the Web of Life (2006) by Christopher Key Chapple, p. 217.